Cocktails, as you can probably tell from my many posts are a bit of a hobby, and dare I say a bit of passion of mine. I currently have 10 books relating to the subject but the Ultimate Bar Book by Mittie Hellmich is my go to reference when I want to either try something new or make a classic recipe. 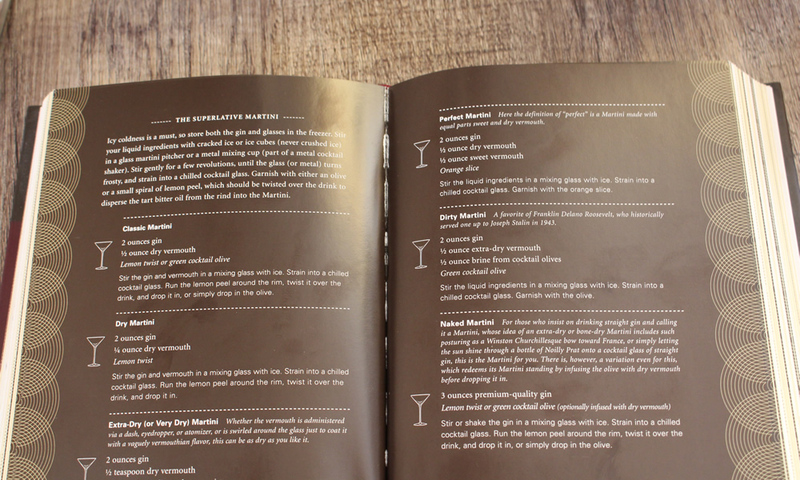 The book splits the recipes into 10 sections according to the main alcoholic ingredient; rum, gin, vodka, Champagne etc. plus other sections such as non-alcoholic, punches and hot drinks. By splitting the recipes in this way cuts down the amount of flicking through the book to find a recipe with a particular main ingredient. Along with this, are two indexes at the back of the book; one with an A-Z of cocktail names (great for finding out such mysteries like “what the hell is a Rob Roy”?) and an A-Z by ingredients. With the ingredient A-Z this book really comes its own, saving you time in looking for a cocktail you can make with a particular liqueur or spirit. This is great when you find an unusual ingredient in the back of the drinks cabinet, (you know the ones). 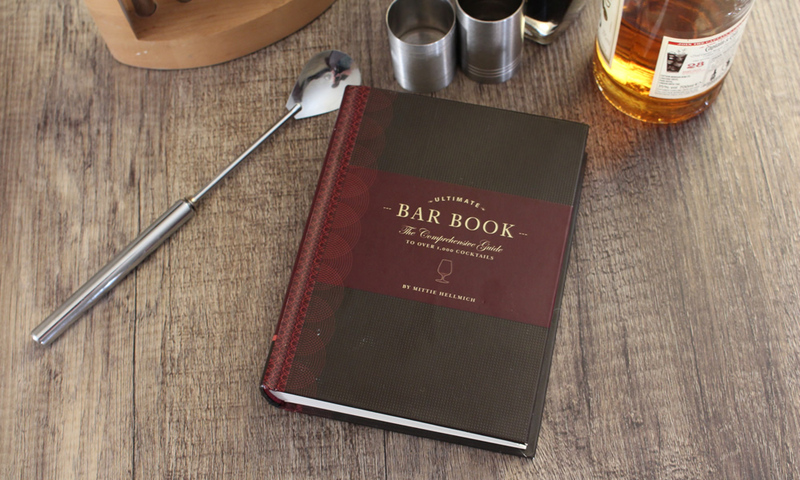 The book starts with a really good introduction chapter of “The Essential Bar”, with information about equipment, types of glasses and even a chapter on starting your own home bar. These really give you a good base knowledge about everything you need to know to begin making cocktails, and even though it’s directed at the novice there are some useful tips for all levels of the cocktail connoisseur. 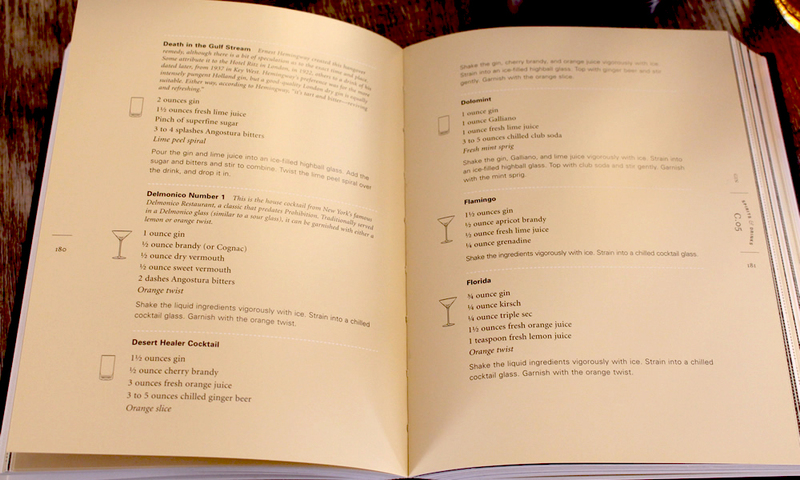 By far the main content of this book is where it puts itself above all other cocktail books are the recipes themselves. Not only by the shear number (over 1,000) but how they are laid out. Every recipe is well laid out with clear ingredients and even an icon of what glass it should be served in. The more famous cocktails such as the margarita or martini have their own sub-sections with histories about the drinks and their variations (pictured below). These, along with introductions about the core spirits are great for anybody wanting to know a bit more about the drinks they are making. The Ultimate Bar Book isn’t without its faults however, for one thing, there are no pictures. Understandable seeing there are over 1000 cocktails so having a picture off all of them would be impractical but a couple of the more photogenic and classic recipes would have been nice. Due the size of the book and the shear amount of information within the text is quite small and the “more-seasoned” eyes might find it difficult to read. These are really minor quibbles that shouldn’t put anyone off buying the book, but might help some not being disappointed/surprised by the lack of pictures or small type.